Do you know what makes a birthday party even more exciting? Having to hunt down the birthday present! 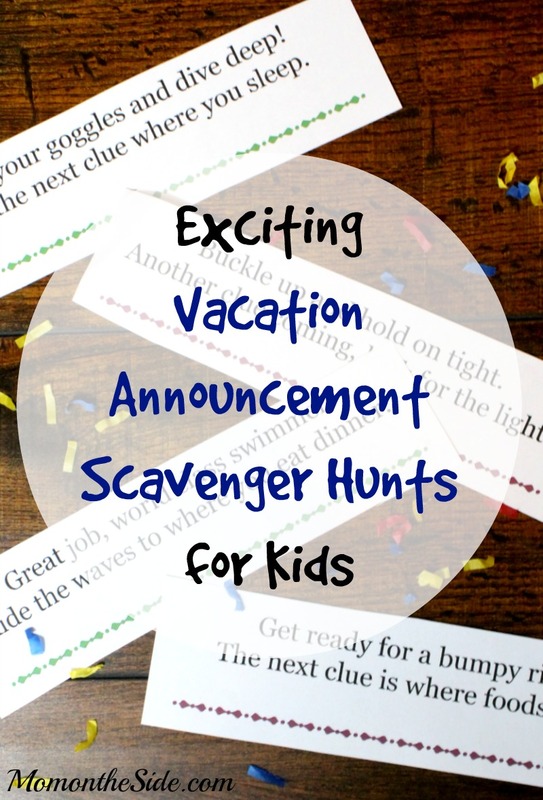 These printable Birthday Scavenger Hunt Clues for Kids are fun AND easy enough even little kids can play. 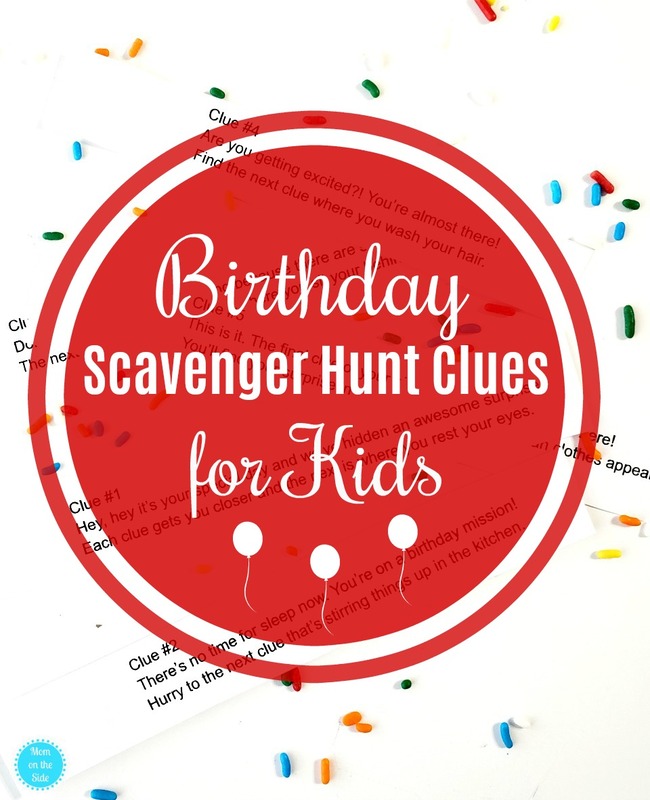 There are five clues included in this birthday scavenger hunt along with tips for each clue. You can print them below and I’ve listed them below in case you don’t have a printer. Simply print them or write them out and then cut each clue apart. Hide them in the designated locations and hide the present at the very end location. 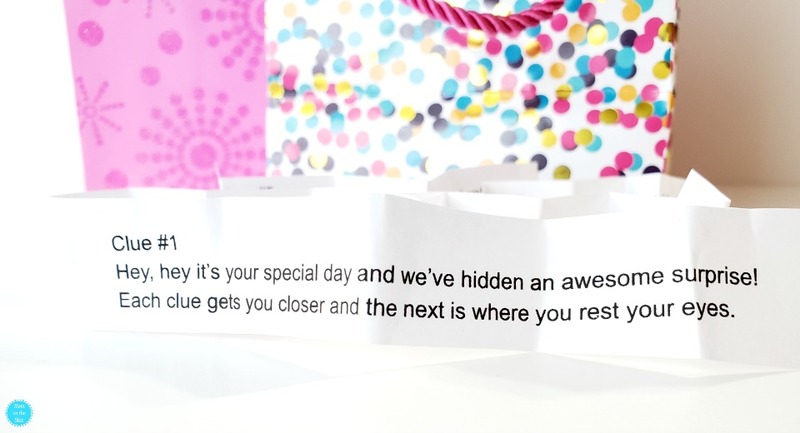 Hey, hey it’s your special day and we’ve hidden an awesome surprise! Each clue gets you closer and the next is where you rest your eyes. Tip for Clue #1 – Give to the birthday child to start the hunt. There’s no time for sleep now. You’re on a birthday mission! Hurry to the next clue that’s stirring things up in the kitchen. Tip for Clue #2 – Hide this clue somewhere on their bed – under their pillow is a great place. Don’t stay in the kitchen too long because there are still clues to find. The next one is hiding in a place where you sit your behind. Tip for Clue #3 – Hide this clue in a mixing bowl, with spoons, or with a mixer in the kitchen. Are you getting excited?! You’re almost there! Find the next clue where you wash your hair. Tip for Clue #4 – Hide this clue on or under a chair or couch cushions. This is it. 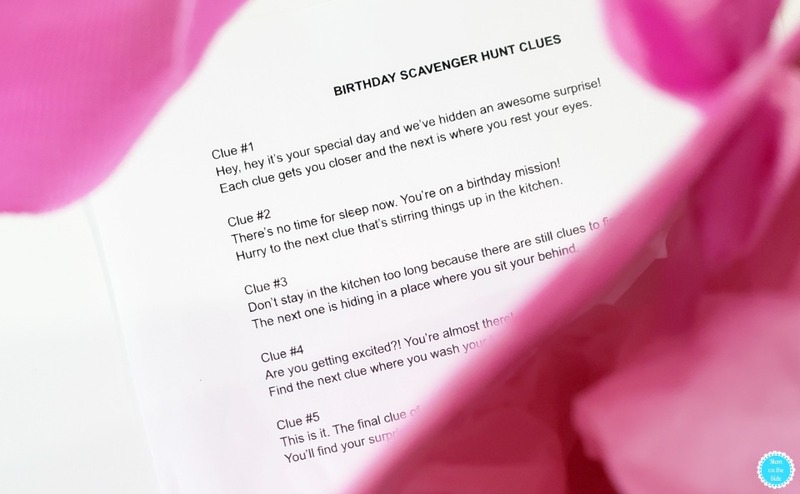 The final clue of your birthday scavenger hunt is here! You’ll find your surprise in something that makes clean clothes appear. Tip for Clue #5 – Hide this clue in the washer or dryer along with their surprise.